In a new twist, the woman who blamed her husband for sending ricin-laced letters to President Obama and New York City Mayor Michael Bloomberg was charged Friday with sending the letters herself. NBC's Ann Curry reports. A Texas woman has been arrested in connection with the mailing of three letters containing a form of the poison ricin to President Obama, New York City Mayor Mike Bloomberg and the director of Mayors Against Illegal Guns, federal authorities said. Richardson is an actress with minor roles on television shows like The Walking Dead and the Vampire Diaries, and was arrested in Arkansas on charges that will be filed Friday afternoon, the authorities said. She has five sons, according to the New York Times. Investigators have been probing who sent the three letters, all postmarked May 20 from Shreveport, La. and sent without a return address, authorities have said. Authorities are still investigating the three ricin-laced letters sent to Michael Bloomberg, President Obama, and a lobbyist, but Texas-based actress Shannon Rogers Guess has said her Army veteran husband Nathanial Richardson is behind the letters. NBC's Stephanie Gosk reports. The letters sent to Obama and Bloomberg were discovered during routine mail screenings processes. The letter to the director of Mayors Against Illegal Guns, Mark Glaze, was opened. The toxin ricin can be made from castor beans, has no antidote, and takes about 36 hours to kill. Mayors Against Illegal Guns is a group that advocates for stronger gun laws and was founded by Bloomberg. In a separate case involving ricin in recent months, police arrested James Everett Dutschke, 41, on charges that he sent letters containing ricin to the president and other officials in a separate case. The martial arts instructor has pleaded not guilty, and his trial is set of July 29, Reuters reported. 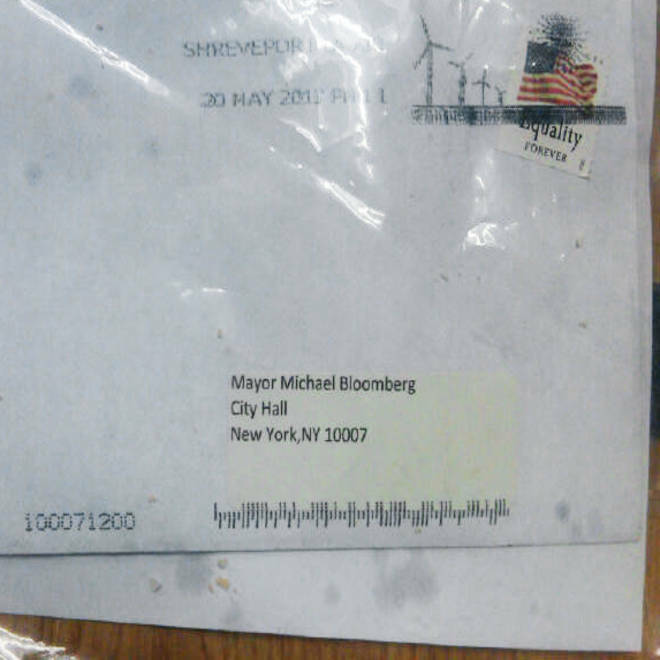 Letter addressed to New York Mayor Michael Bloomberg that was found to contain a form of the poison ricin. The letter is postmarked May 20 from Shreveport, La. Who sent ricin letters to Bloomberg, Obama?